1822 … Sarah Bracewell was born in Cowling, West Yorkshire to parents Robert Bracewell and Leah Snowden. She is the wife of my 1st cousin 4x removed. 1848 … Elizabeth Dawson was buried at St. Anfrew’s church in Kildwick, West Yorkshire. She is my 1st cousin 4x removed. 1866 … Martha Jane Paley died at Threshfield, Yorkshire. She is my 1st cousin 3x removed. 1876 … George Britcliffe and Ellen Rose married at Glentham in Lincolnshire. George is my wife’s great grand uncle. My 2x great grandparents married today 139 years ago. Thomas Turner was born in Kendal, Westmorland about 1847 although I haven’t yet been able to find a definite record of his birth. Mary Jane Carradice was born on 8th November 1854 also in Kendal. They married on 29th June 1872 at Kendal Register Office. The witnesses were Miles Barry Harker and Hannah Harker. I had never come across the name Harker before in my family tree. So while preparing this post I decided to see if I could find any connection between Miles and Hannah and Thomas and Mary Jane. 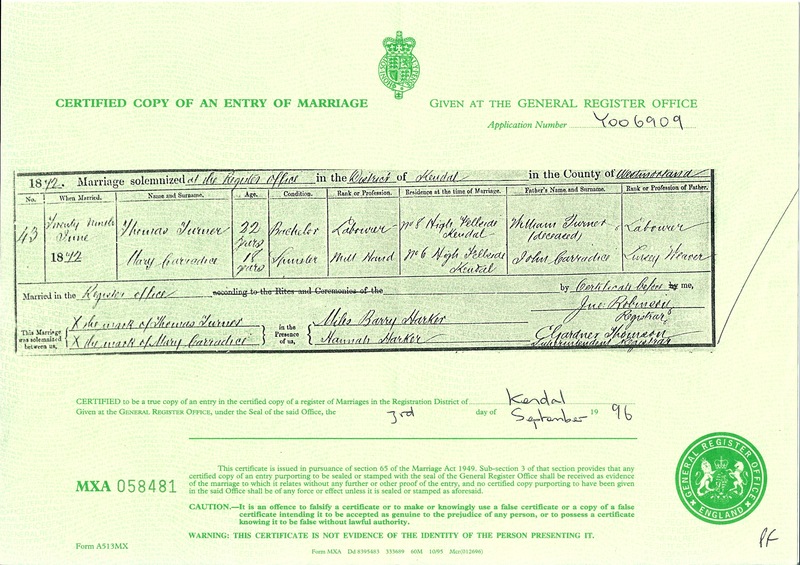 The only link I have been able to establish is that all four appear on the same page of the marriage register – which clearly suggests to me that they were married on the same day at Kendal Register Office. Presumably Miles Barry Harker and Hannah Fisher tied the knot first given the witness names on Thomas and Mary Jane’s marriage certificate. I wonder if Thomas and Mary Jane performed the role of witnesses for Miles and Hannah. Maybe they were all friends or perhaps this was the first time they had even met. The lack of family witnesses has me thinking that perhaps Thomas and Mary Jane married without their families consent – or am I reading too much into this. I guess that I will never know. Over the years the family migrated south to Clitheroe in Lancashire. Thomas died on 7th December 1916 and Mary Jane on 18th April 1917. 1872 … Mary Jane Carradice and Thomas Turner married at Kendal Register Office in Westmorland. They are my 2x great grandparents. 1897 … Mary Ellen Gawthrop (nee Snowden) died in Burnley, Lancashire. She is the wife of my 1st cousin 3x removed. This is the headstone at the grave of John Smith Buckley and his wife Mary Ellen. I took the photograph yesterday. 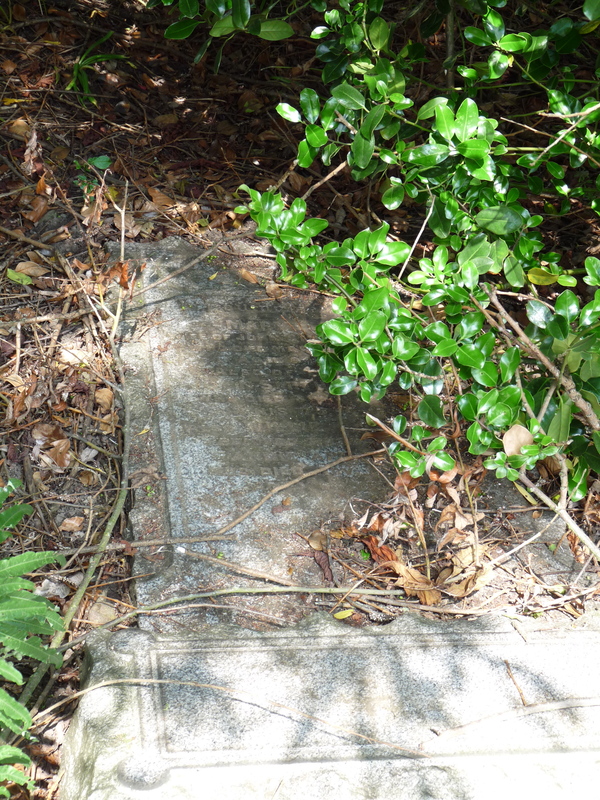 The grave is at Utley Cemetery, Keighley, West Yorkshire – it is grave number 494 in section N.
Clearly as you can see the headstone is in a very poor state with the top having broken away from the base. Also the ground around it is overgrown. Even so, after a bit of brushing away the dirt and debris, I was able to just make out the inscription. John Smith Buckley is my 1st cousin 3x removed. He was born sometime in 1858 in Keighley, West Yorkshire. His parents were Mason Buckley and Susannah Hargreaves. In the 1861, 1871 and 1881 census returns John is living with his parents. In 1871 he is working as a “worsted spinner” and in 1881 as an “iron moulder”. Sometime in the March quarter of 1882 John married Mary Ellen Brigg. Mary was born about 1854. I have only done some very quick searches for her on the subsequent census returns but haven’t found a definite entry for her. John and Mary had two daughters – Annie in 1882 and Ellen in 1887. In the census records for 1891, 1901 and 1911 the family remained living in Keighley. John continued to work as an “iron moulder”. 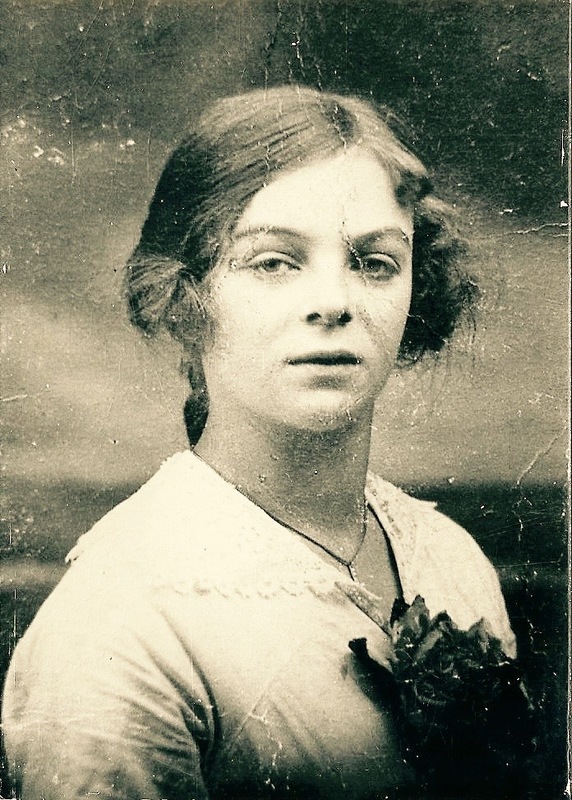 In 1911 their daughter Ellen is still single and living with them – she is employed as a “dressmaker”. Their other daughter Annie married Willie Appleyard in the fist quarter of 1907. In the 1911 census Annie and Willie are living with Elizabeth Brigg – who appears to be a sister of Mary Ellen (Annie’s mother). I mention them particularly because Willie was also buried with John Smith and Mary Ellen when he died in 1947. Anyway, Mary Ellen died on 19th March 1918 and was buried three days later at Utley Cemetery. At some point after he was widowed John appears to have moved to Morecambe in Lancashire. The information I got from Utley Cemetery says that at the time of his death on 16th July 1932 he was living at 41 Victoria Parade, Morecambe. The remaining mystery for me is where is Annie Appleyard buried? I found an Annie Appleyard in the National Burial Index who died in 1956 aged 75 years – which puts her at the right sort of age. This person is buried at a church in Doncaster, South Yorkshire. So I will need to do far more detective work to discover if this is my Annie Appleyard (nee Buckley). 1932 … Herbert Espley died. He is my wife’s 1st cousin 2x removed. This is a postcard of St. Peter’s church at Markby in Lincolnshire. The church has no family significance at all – I just really like it so I bought the postcard. 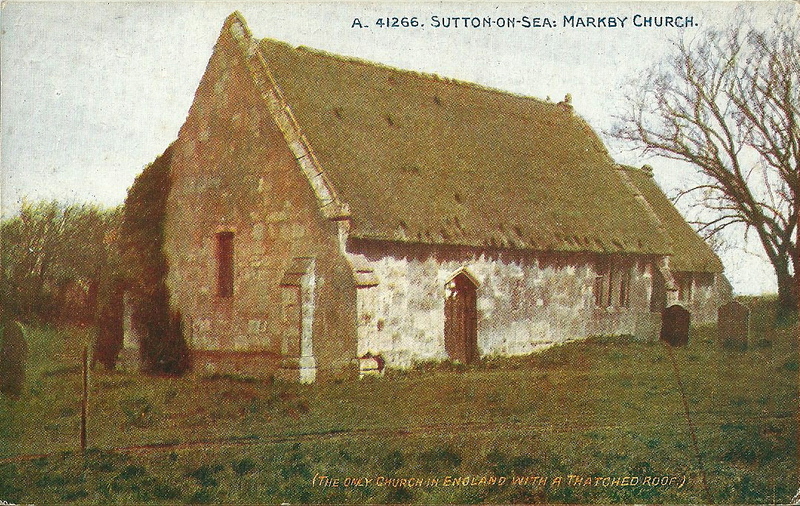 The postcard is unused and is part of the “celesque series” published by The Photochrom Co Ltd.
St. Peter’s is one of the few remaining thatched churches in the UK and the only one in Lincolnshire. Here is an article from The Telegraph written in August 2007 about “The surprise of thatched churches”. Markby village is situated 3½ miles from Alford and consists of about two dozen properties. The church stands on the site of an old Augustinian Priory, and in fact is partly built of stone rescued from the priory ruins. After the founding of the priory in 1160, the local people were encouraged by the Canons to use the Priory Church. On the Dissolution of the Monasteries by Henry VIII they obtained permission, first to use a comer of the old priory and then in 1611 to build the present church. In the first instance the roof was tiled, but in 1672 Richard White, churchwarden, substituted a thatch, taking the tiles as payment. By the late 19th Century St. Peter’s was in a sorry state and incapable of being used regularly so a new corrugated iron church, “Christ Church”, was erected near by – the old church being retained for funerals and the occasional wedding. However by 1962 this “tin church” was rusting and irreparable so it was decided to renovate old St. Peter’s. Today the interior of the church still bears traces of its history – the Norman dog-toothed decoration on the chancel arch, the former oak cross beam rescued from the roof bearing a date of 1611, together with the ancient font from the old parish church, the 13th Century rose sculpture and the 19th Century box pews. More photo’s here. The thatched roof was replaced in 2008. 1795 … Susannah Mitchell was born in Bradford, West Yorkshire to parents Abraham Mitchell and Anne Crosby. She is the mother in law of my 2nd cousin 3x removed. 1806 … David Overton was born to parents Henry Overton and Mary Watson. He is the brother in law of my 3x great grand uncle. 1852 … David Snowden and Martha Wilkinson married at Habergham Eves in Lancashire.